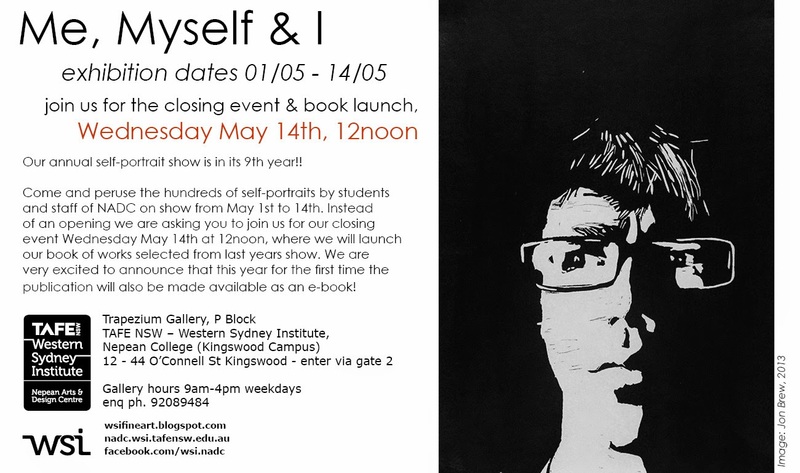 Our annual show, Me, Myself & I is back again - the walls in the Trapezium gallery are currently lined with hundreds of self-portraits by students and staff of NADC. The show is open from 01/05 - 14/05 9am - 4pm weekdays, with a closing event on Thursday the 15th Wednesday May 14th at 12 noon. At the closing we will launch our book of selected works from last years show, and for the first time it will also be available as an e-book! We will also be converting our previous publications to e-books. You can view (and order) books from previous years by clicking on the links in the sidebar (but the new book, and e-books, won't show up there until the launch on the 15th 14th). We hope to see you there!